Mr. Gavin Grant, CEO of RSPCA (above) and top to bottom Dr. Atul Shah, Barbara Gardner, Simon Keyes - All Photos by Bhavik Haria of Cincera Productions. 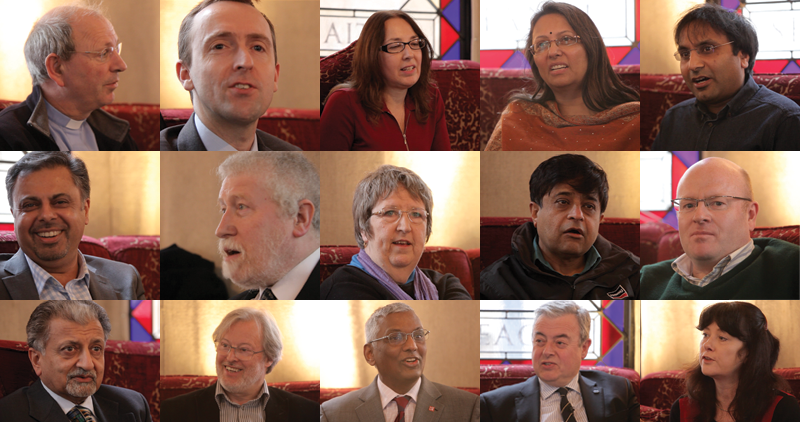 On Monday 18th February 2013, a historic dialogue between members of various faith groups and the RSPCA was held at St. Ethelburgas Centre for Reconciliation and Peace in the heart of London. The Chief Executive of the oldest animal welfare charity in the world, the RSPCA, is presently on a mission to engage with faith communities, and was the main speaker at this meeting. Mr. Simon Keyes, Director of St. Ethelburgas and host of the event, welcomed everyone and explained why for there to be human peace, we also need to make peace with animals and nature. Present among the delegation were members from the World Congress of Faiths, the Quaker Concern for Animals, Catholic Concern for Animals, Jamyang Buddhist Centre, Hindus, Jains, Humanists, Church of England, Ki-Rin and Young Indian Vegetarians. 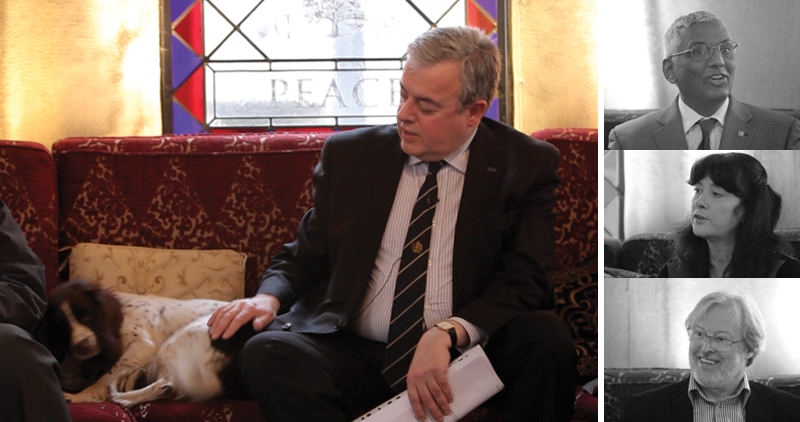 Mr. Gavin Grant, CEO of RSPCA, explained how faith groups were at the centre of the formation of the RSPCA in 1824 and he is keen to diversify the organisation and connect with the changing demographic of Britain. Over the last 6 months, Gavin had been travelling with Dr. Atul Shah of Diverse Ethics to personally meet a range of faith leaders and communities and open up dialogue. Everyone who met RSPCA leaders were impressed by the depth and range of animal welfare initiatives, and the professionalism and clarity of their vision and purpose. Articles, films and photos of the visits are in the related links below. Their trustee Barbara Gardner has also written a major new book called 'The Compassionate Animal' which is detailed below. For Diverse Ethics, this whole project has been proof of the huge strength and vitality of diverse Britain, and its power to embrace and welcome difference, through hospitality, generosity and wisdom. This true story of Britain is rarely seen by public and private leaders who do not see it as worth their while to witness what is happening inside these diverse communities, and how resourceful, creative and hospitable they are. It is very important to understand what makes these communities tick, and work with them through cultural intelligence and insight. In this respect, Gavin Grant has been a pioneering leader and ambassador, and this whole experience has opened the vast opportunity of diversity. A beautiful film produced by Bhavik Haria of Promotional Business Videos of this historic event can be viewed here. It creatively captures the atmosphere and spirit of this historic event. The award-winning BBC Radio 4 programme Beyond Belief, also decided to broadcast a special discussion on the subject of Animals and Faith, which was very good, and Barbara Gardner, trustee of the RSPCA, was one of the speakers. You can listen to it on-line by clicking on the BBC link in this paragraph. There are now proposals to set up a national inter-faith network for animal welfare and an inter-faith advisory board for the RSPCA to continue and build on this historic initiative. At present there is a national debate around leadership and diversity in Britain, ranging from subjects such as Boardroom Diversity to Institutional racism and the ghettoization of senior management. The 2012 census has shown clearly how increasingly diverse the society is becoming, and this needs to be reflected in the national policies, thinking and leadership if we are to grow and prosper as a democratic nation. The RSPCA is clearly making a very important start in this direction.